John Donohue broke into professional basketball during the 1902-03 season with Xavier in the Philadelphia Basketball League . In his very first season, the 19-year-old rookie finished second in the league in field goals made. Early in his career, Donohue’s talents were buried on a series of terrible teams. In 1905-06, he finished fourth in league scoring, but his team won only 5 of 28 games. 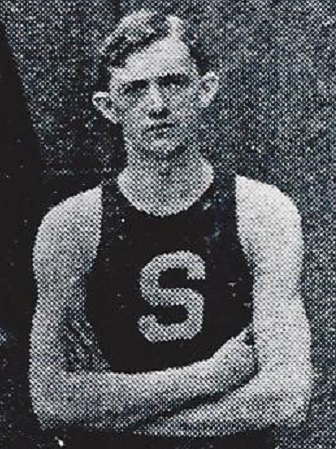 In 1906, Donohue’s fortunes improved when he signed with the St.Simeon team in the PBL. During the I907-08 season, he finished third in league scoring and St.Simeon finished second in the standings. Donohue was the leading the PBL in scoring the following season when the league disbanded in early January. A week later, Donohue signed to play with East Liverpool of the Central Basketball League, but returned home to Philadelphia after just two weeks because of the chaotic situation of the team on route to a numbing 4-67 record. The most rewarding years of Donohue’s career began the next season (1909-10) when he began the first of six seasons with the Jasper entry in the newly-formed Eastern Basketball League. Donohue led the EBL in field goals by a huge margin in his first season with Jasper and led the EBL in scoring during his second season. In 1911-12 Jasper, tied for first place in the EBL, but lost in a playoff with Trenton. Jasper slumped in 1912-13, but returned to form in 1913-14 and won the EBL championship after a three-way playoff for the title. The championship was a personal triumph for Donohue who had unselfishly sacrificed his previous prominent role as a scorer and switched to the unfamiliar guard position for much of the season. Brother of Charles Donohue Born: 1883 Died: Hometown: Philadelphia, Pa.